If galleries and museums exhibit street art, can artists use them like the street? In an illegal art movement the artist Kissmiklos smuggles a Just Decoration Graffiti Tag, printed on 40 cm X 30 cm canvases, into galleries and museums of contemporary art. The uninvited artworks appear on outside walls or secluded places, such as walls of corridors or connecting hallways, where they might look just natural. The art movement plays with the perception of “the artwork“. The exhibit is in fact a fake, only a picture of a real artwork i.e. it is just decoration, isn’t it? 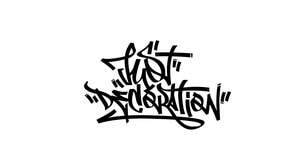 Moreover, the cheeky "Just Decoration“ graffiti script, that the artist printed on canvas, is not a real graffiti of course, but it functions as one: artistic, but absolutely illegal, controversial, but absolutely true. The “Just Decoration“ series comprises a range of artworks that share the same underlying concept. It is an artistic brand that points out the transformation of an art piece: Art is seen as art in the "white cube“ and in art spaces, but leaving those spaces officially determined to display art, it may become just decoration. The “Just Decoration“ pieces grapple with the question: At which point of existence is an artwork actually an artwork? Furthermore, can these two qualities coexist in one? In other words, is it possible that an object is art and decoration at the same time? It is the connection between design and the “divinity“ of art that is at the center of the artist’s investigation.